Everybody"s friend, the golden retriever is known for its devoted and obedient nature as a family companion. It is an apt sporting retriever as well and yearns for a day in the field. Ignoring its active nature and powerful physique can lead to behavior problems, and it needs daily physical and mental exercise. It tends to be overly exuberant and boisterous, and its enthusiasm for everything often distracts it during training; however, it is eager to please and enjoys learning. The golden"s achievements in competitive obedience are remarkable. It especially enjoys games that involve retrieving and loves to carry items in its mouth. 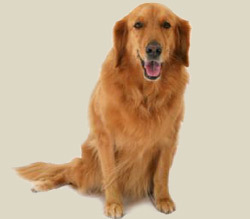 The golden retriever needs daily exercise and human interaction. Challenging obedience lessons, active games or retrieving sessions are all good ways to exercise the golden"s mind and body. Although it is capable of living outdoors, it is such a social dog that it is best when it shares its life with its family. The coat does not tend to mat but needs twice weekly brushing.